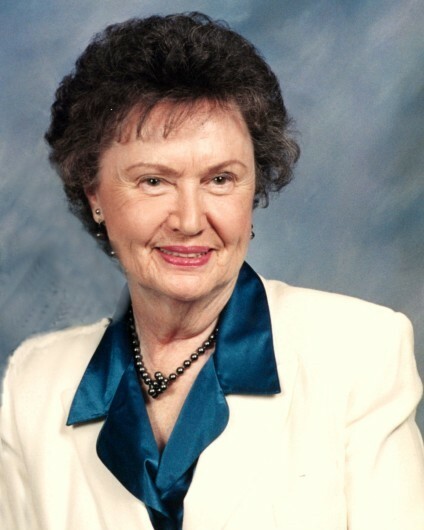 Esther E. Westbrook passed away February 8, 2019 at The University of Tennessee Medical Center in Knoxville, TN. She was born January 29, 1921 in the Birdie Community near Griffin, GA.
Esther attended Young Harris College in GA and a business school and worked at the State Bank in Griffin GA.
During the war, she worked for the Signal Corps at Fort McClellan Alabama and moved to Washington DC with the Red Cross. She then worked in the florist trade in Atlanta and Houston. Esther and Wylie met after the war, married in 1949 in Atlanta, and made their home in Chattanooga for 62 years. A devoted Christian, she first attended Westminster Presbyterian and then made Brainerd Presbyterian her church home for 40 years. Esther retired as an administrative assistant at Cutter Laboratories after 13 years. She volunteered for the Red Cross, Job Corps, served as a Girl Scout leader, and was president of Madonna Acres Garden Club. Esther loved gardening, nature, being outdoors, reading, travel, camping, painting, senior groups and church activities. She will be remembered for her love of family, neighbors, friends and also for her creativity with flowers, painting, and especially for her loving care of Wylie during his last years. She was preceded in death by her husband of 63 years, Wylie C. Westbrook; parents, Chabe Lloyd and Daisy Posey Elder; brother, David Elder; sisters, Grace Mazloom and Ida Weaver. Esther is survived by daughter, Jan and Jim McKinney of Lenoir City, TN; grandson, Mark and Katy McKinney of Knoxville, TN; granddaughters, Caroline and Jon Karnes of Hallowell, ME and Sarah and Matthew Cox of Knoxville, TN; great-grandchildren, Drew, Mary Helen, Eliza and Katherine McKinney, Wylie and Emma Karnes, Claire and Jude Cox, and many nieces and nephews. Esther's family is deeply grateful to her loving caregivers at River Oaks Place of Lenoir City, L&L Sweet Home Care, and The University of TN Hospital 6th floor East staff and hospice services. A private family funeral service will be held at 11 a.m. on Saturday, February 16, 2019 at Brainerd Presbyterian Church. In lieu of flowers, memorials donations may be made to Brainerd Presbyterian Church, 1624 Jenkins Road, Chattanooga, TN 37421 (www.bpcepc.org). Arrangements entrusted to Heritage Funeral Home, East Brainerd Chapel.